Everyday over 3 billion people in the developing world cook food on open fires or inefficient cook stoves fueled by coal or solid biomass. This action jeopardizes human health, contributes to household & community air pollution, and impacts environmental devastation by depleting forests and increasing soil erosion. An estimated 4 million premature deaths occur every year due to exposure from toxic smoke emissions. Consequently women and children are disproportionately impacted by household air pollution. SilverFire’s mission as a leading designer of clean cook stoves is to protect humans from the health and environmental impact of emissions from open fires, inefficient cook stove designs and the destruction of forests, due to illegal charcoal production and inefficient fuel use. SilverFire is headquartered in Eugene, Oregon. 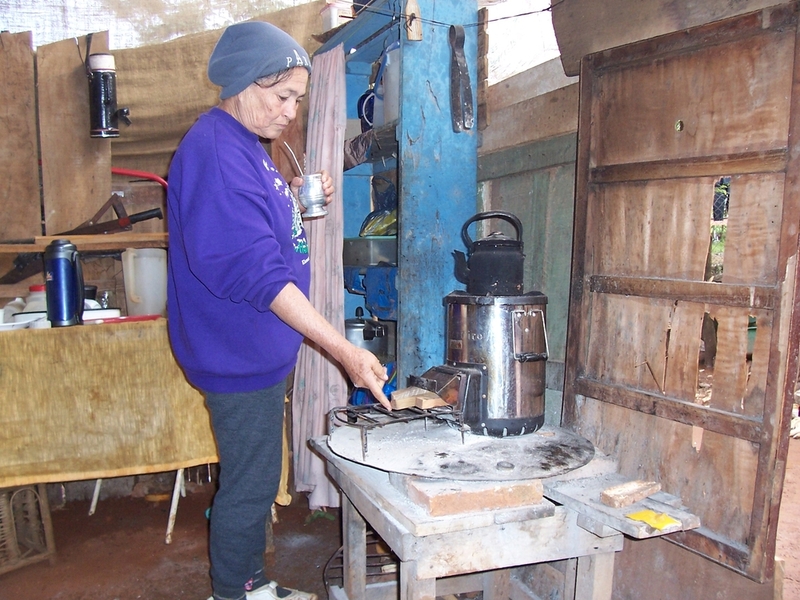 Our humanitarian stove program is structured on a direct FOB unit stove cost for developing World locations. This specialized price schedule is not applicable for developed World markets. Please contact us at sales@silverfire.us for pricing and the scope of your humanitarian project. Our Survivor rocket stove, Hunter Chimney stove, and skirted Dragon Pot are 3 of our most popular humanitarian products. SilverFire thinks it makes more sense to donate stoves for families to sanitize water, cookware, and cook a meal while being surrounded by free biomass after the 2017 hurricane season. Instead FEMA tax dollars are being used to send generators to Puerto Rico, despite limited available fuel and infrastructure. Lunch break! 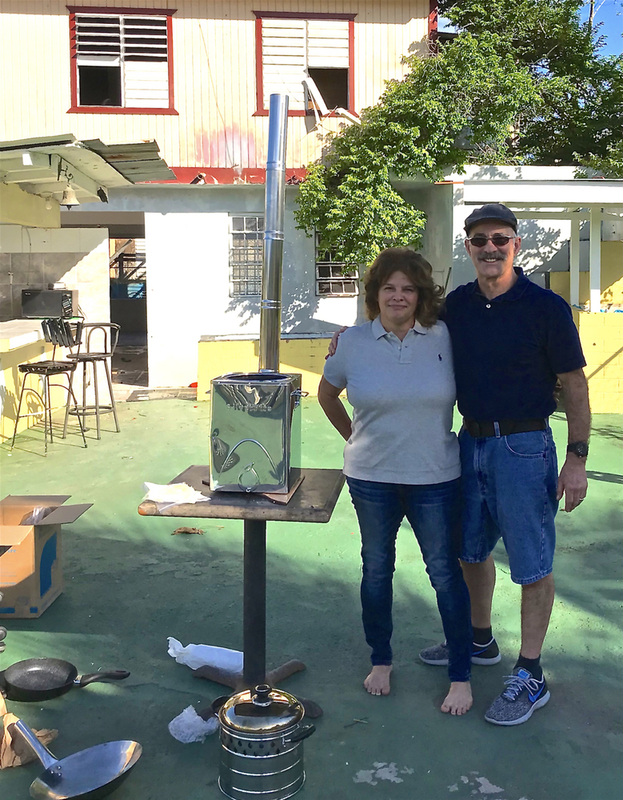 All Hand Volunteers with SilverFire Survivor rocket stove, Virgin Islands 2017. 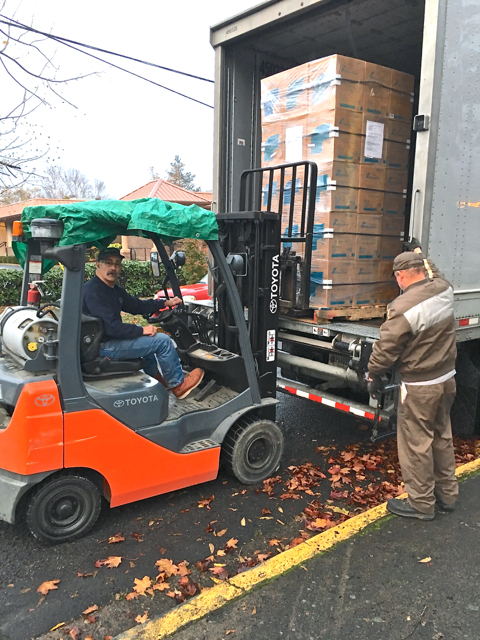 Our 1st donated pallet of Hunter Chimney stoves headed to Puerto Rico in early November (photo below). We will continue to assist, but we need assistance to cover humanitarian stove costs and transportation costs to Puerto Rico. 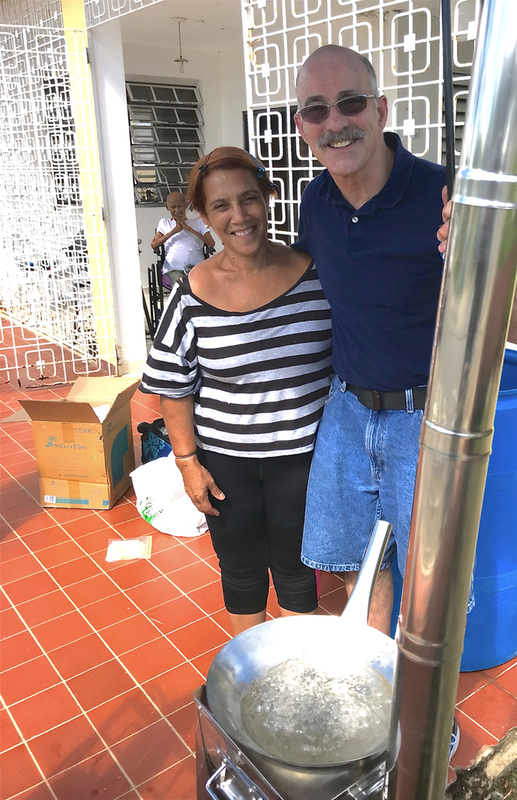 We partnered with University of Oregon's UCEDD sister program in Puerto Rico, so we could get stoves to our donated stoves in to the hands of families with children with disabilities. We contacted a number of NGO's and Aid organizations, but none really appeared interested in assisting Puerto Rico. We are actually a small for profit organization and are tired of seeing non-profits that claim to be active in the stove and aid sector, but are actually using donations for staff salaries and other perks. 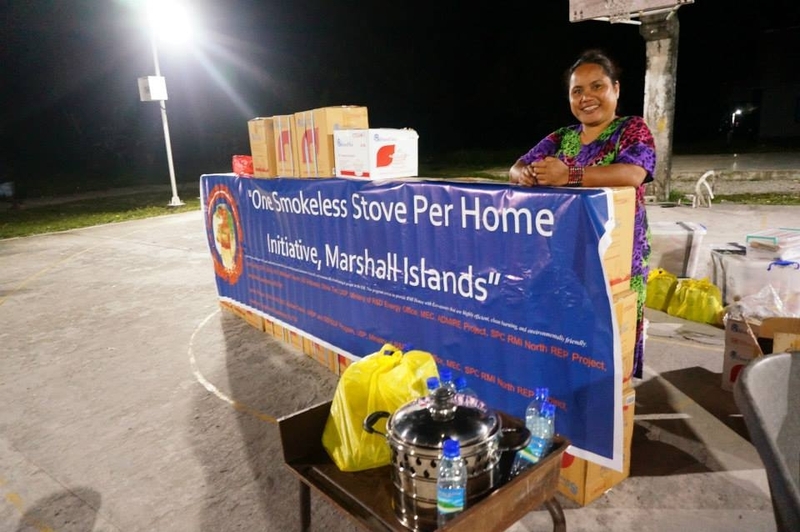 These donations are strictly earmarked for actual stoves and transportation costs. We need donations though to continue to support this activity. 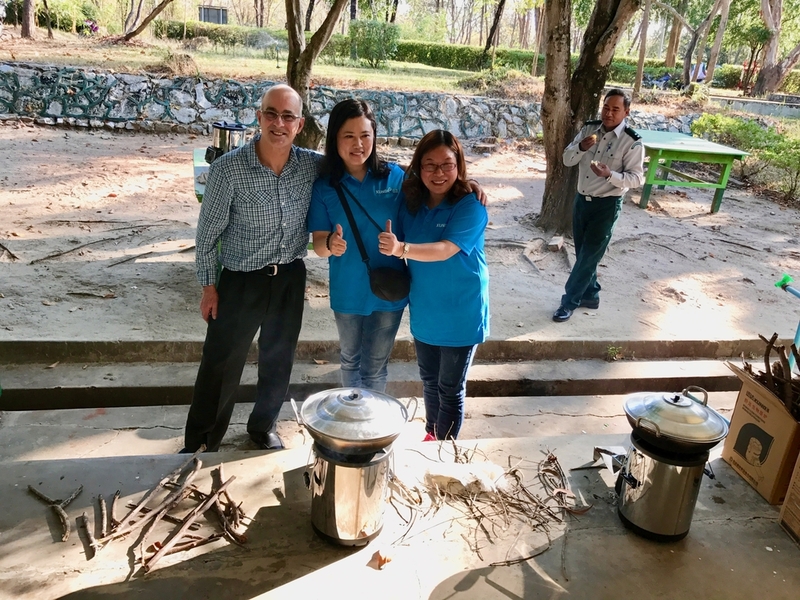 While the Global Cookstove Alliance and other NGO's executives and organizations members enjoy gourmet meals and travel to conferences Worldwide and talk about implementing stoves, little is done. Unfortunately, your hard earned donations are often not going where you intended them to go. SilverFire actually spends 100% on actual stoves and transportation costs only. 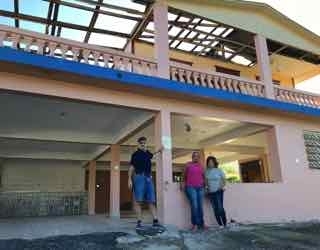 Puerto Rico Update: December 2017, 100 days post Hurricane Maria. 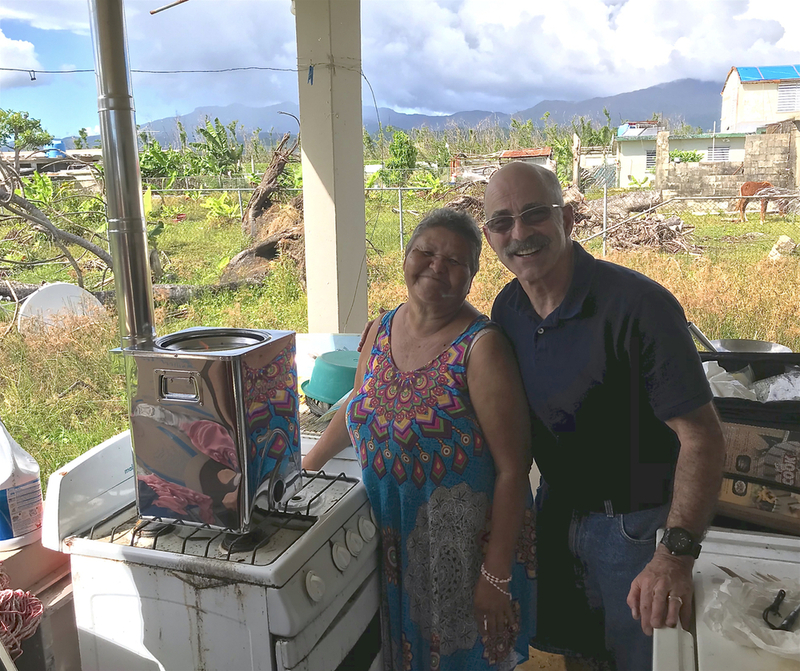 In Virginia visiting grandkids when notified stoves had finally arrived prior to Christmas holiday, and was requested to come immediately to Carolina, Cuguas, and Southern side of islands to train staff with stoves from MAVI, University of Puerto Rico and others that assist clients and families with disabilities. It was snowing in Virginia at the time, but after a quick trip to Goodwill, I was outfitted with hot weather apparel and left immediately for San Juan. 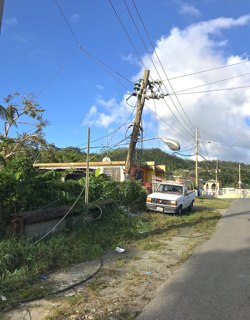 The north side of the island and historic San Juan did not reflect the conditions to the South, that still was without power. Deaths from folks on respirators, ventilators, C-Pap machines, or simply required refrigeration for insulin were still ongoing, however were tallied as natural deaths, not Hurricane related. 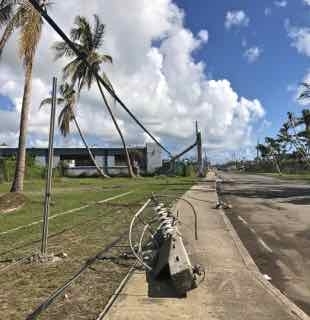 The actual deaths were hurricane related, due to lack of electrical infrastructure, despite official reports otherwise. 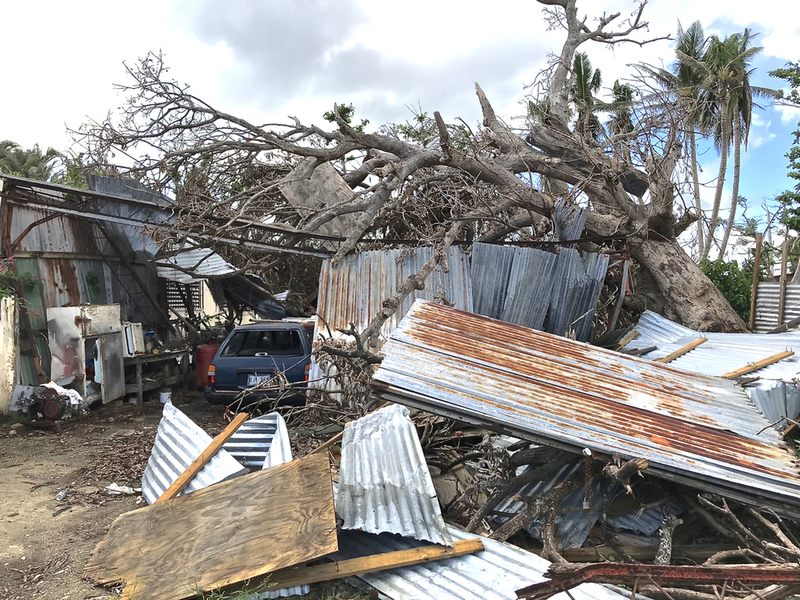 Many of the small FEMA generators were not capable of 24/7 operation, lack of fuel, or money for fuel were additional factors exacerbating situation. Ironically, this woman was Maria, she lost everything. 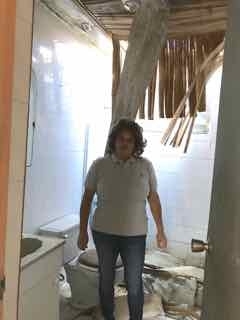 She and her children with disabilities rode out Hurricane Maria in her bathroom. She had a FEMA placard placed on her home identifying qualification for a free tarp posted earlier in November, yet as of Christmas, none had yet to appear. She now at least has a stove to cook, sanitize water, and clean, as she tries to put her life back together. This is Isabella below and her father. Six feet of ocean water rushed through home, Isabella almost drown while hanging on and floating her father (in the wheel chair in photo background) by the collar and holding on to railing. Their home was also destroyed, water is boiling on Hunter Chimney stove in wok. She appreciated the lack of smoke and plenty of free fuel available everywhere post hurricane. Isabella's neighbor. 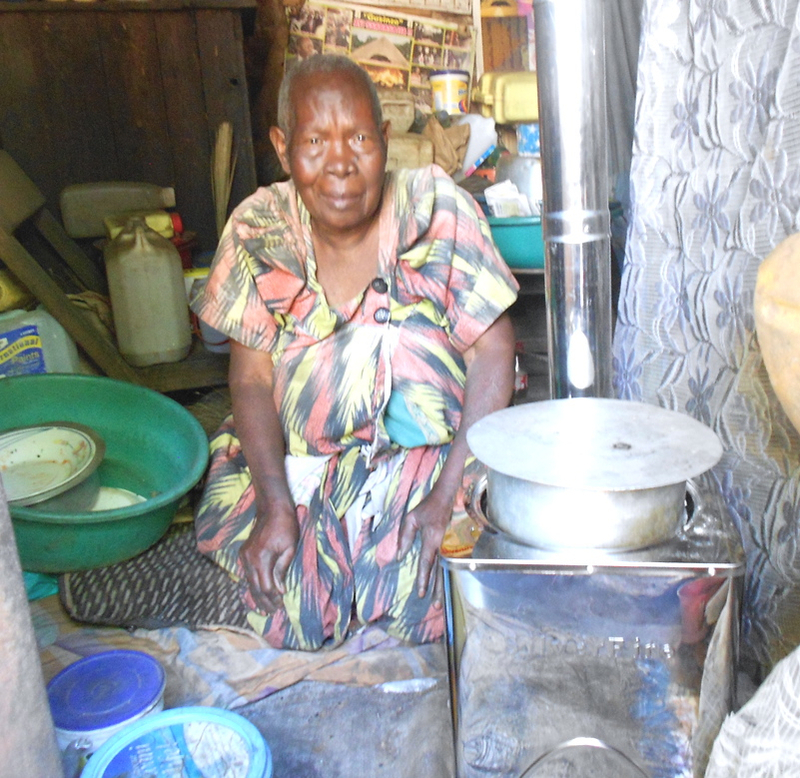 Our stove is her only option to cook, after ocean surge ruined her home and left her range un-operable. there also is no gas infrastructure available. They didn't think much of FEMA's 3 day recommendation for emergency food. It is now over 100 days post Hurricane Maria and the Southern side of the island is still in real need. This situation is still a disaster for countless American Puerto Rico citizens. 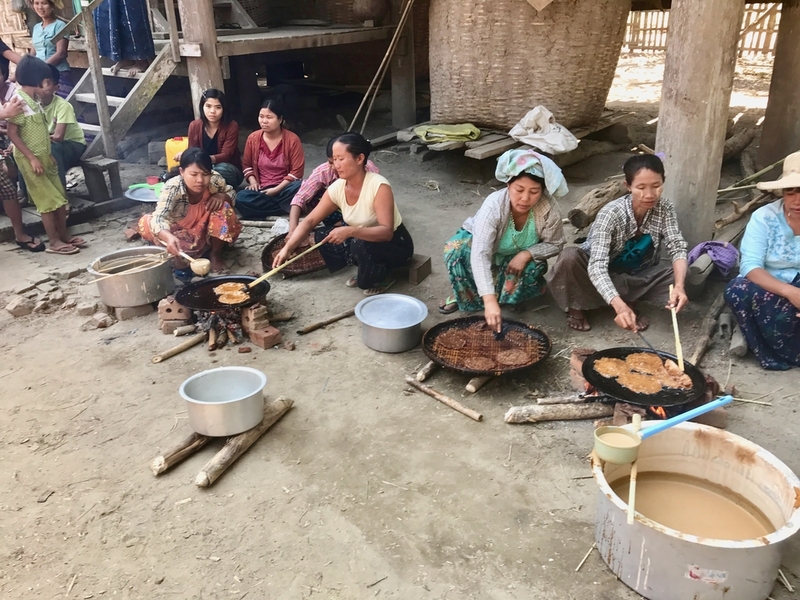 In Spring 2017 SilverFire was requested to come to Myanmar for humanitarian stove consulting and inservice stove training with the Myanmar Forest Service. 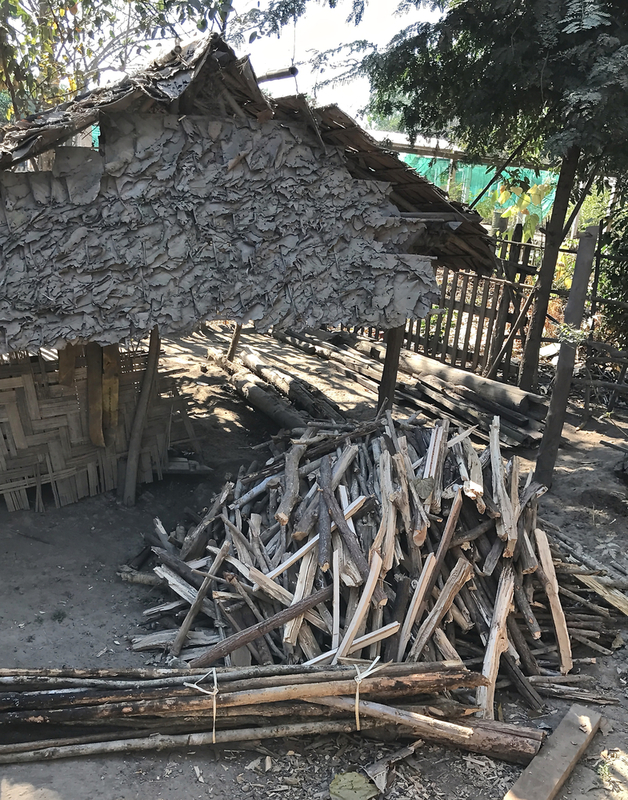 An estimated 90% of rural families burn wood on a 3 brick or 3 stone fires, exacerbating lung disease from inefficient cooking practices. Myanmar's deforestation is now a national crisis. 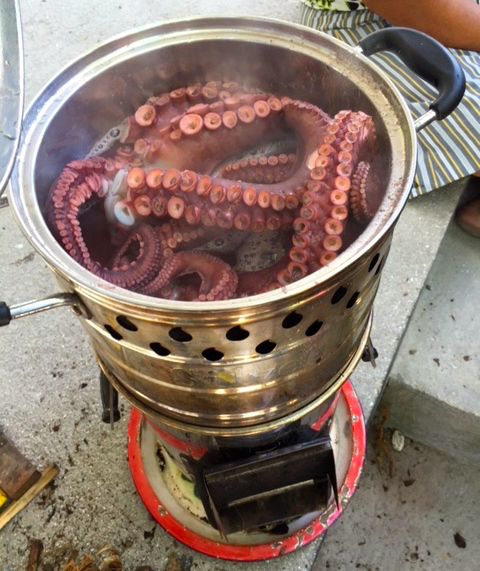 Traditional cooking shown below. 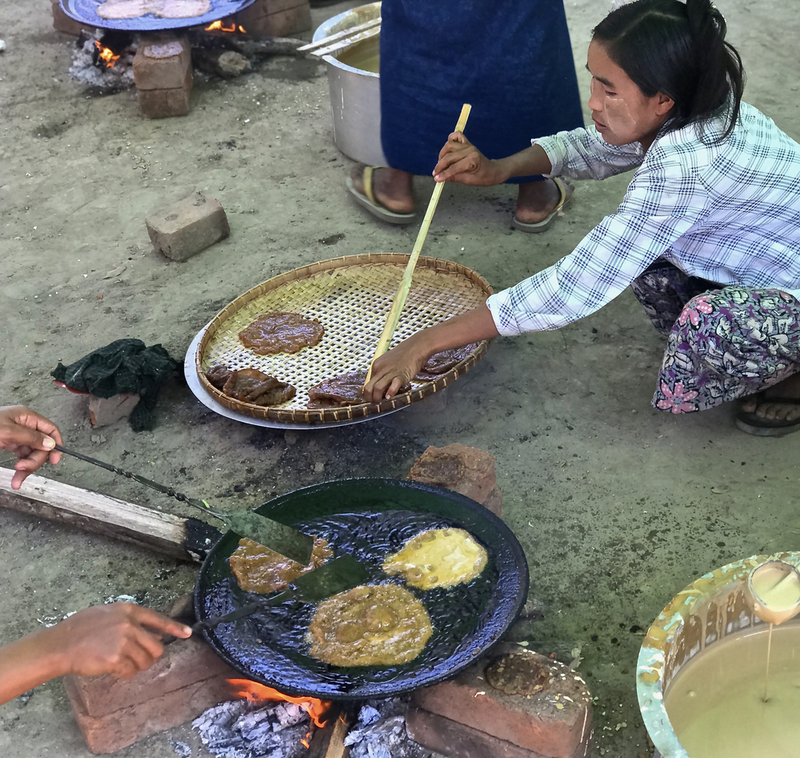 Note wood paste applied on Myanmar woman's cheeks, this is home made UV sunblock and is also associated with anti-fungal properties. 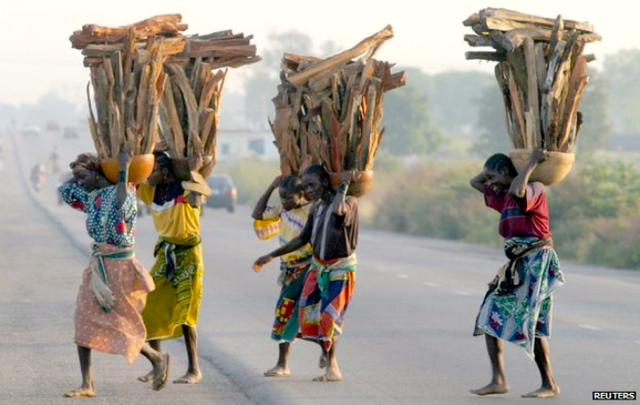 Intense wood collection efforts are a daily requirement to cook and sanitize water for rural poor. This is an indoor kitchen / pantry for multiple families, note indoor 2 brick range. 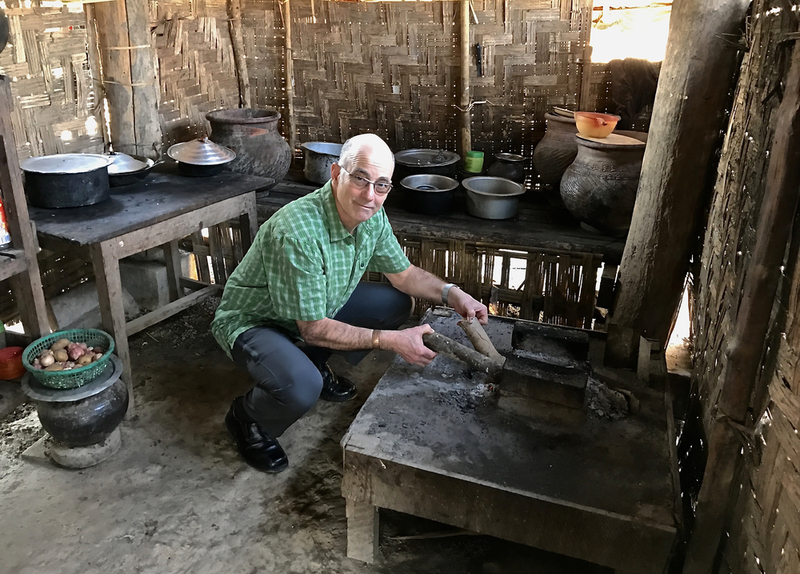 SilverFire Survivor rocket stove inservice, Forest Service Center Naypyidaw, Myanmar. 10,000 clean burning cookstoves gifted by Chinese government, to assist poor women and children. Demonstrating our low fuel use, clean burning stoves! 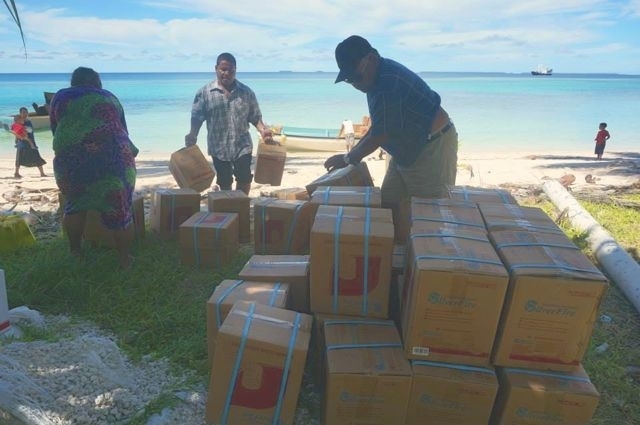 Marshall Islands Project: This container of stoves were purchased with UNDP (United Nations Development Plan) funding, and coordinated by the KIO organization based in Majuro. Our products were chosen over StoveTec and EcoZoom, due to greater efficiency and durability. 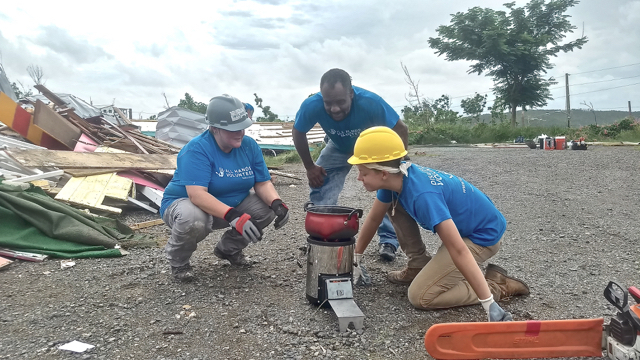 SilverFire provided all stoves at humanitarian pricing and donated skirted Dragon Pots to maximize reductions of required fuel, emissions, and reduce time to boil for these folks. The primary fuel used in the Pacific Islands is palm fronds and spathe, used to sanitize water, cookware, and to cook a meal. 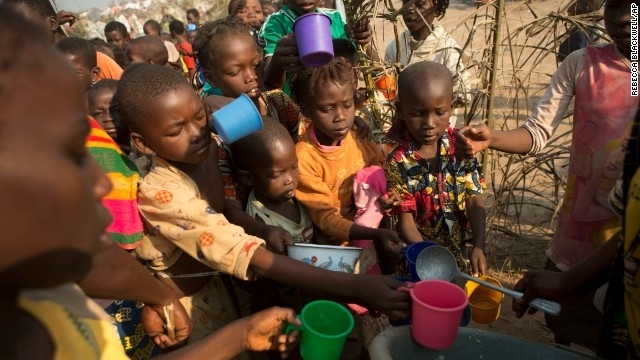 Well designed cookware can have a dramatic impact on the outcomes of a successful humanitarian project. 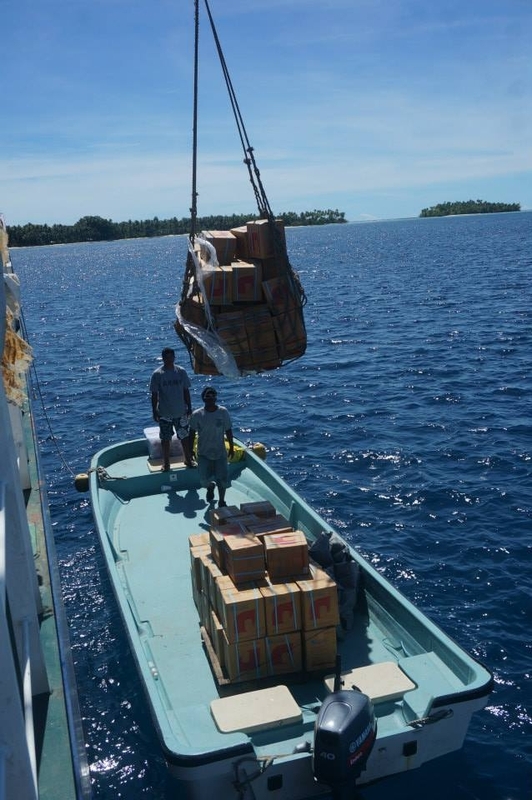 Stoves & Dragon Pots were distributed to outer Marshall Island inhabitants by KIO volunteers in small boats. 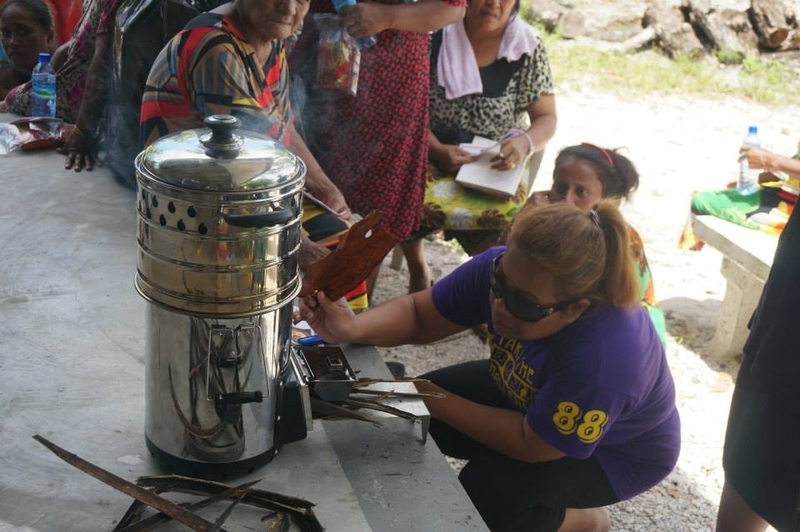 A KIO volunteer below demonstrates how to insert palm fronds into combustion chamber and use our Dragon Pot on top of stove. Here is our Dragon Pot at work in Kiribati for a humanitarian meal (formerly known as Gilbert Islands) near the Tarawa Atoll. Below is a stove operation video of our most popular humanitarian stoves, The Silver Fire Survivor Rocket Stove, and Hunter Chimney stove. This video was done for a Malaysian audience that did not speak English, so it is a great visual "how to" demonstration with just music. These stoves are demonstrated indoors, to show how clean they can burn with dry optimal biomass. Appropriate real world application is to use a side-fed rocket stove outdoors since they have no chimney and to vent all emissions outdoors with any chimney stove. This was a simple how to light and use the stoves and the importance of using dry fuel demonstration only. The intent of our humanitarian stove project pricing program is to foster self sustaining business creation and to protect of our global air shed. Humanitarian pricing requires bulk stove purchasing by container volume orders. Insured CIF transportation and administration costs from Port to Port are applicable. A 50% deposit is required to initiate volume factory stove orders and the balance is due at time of shipping. Inter-continent and Intra-continent transportation, customs clearance, associated duties or tariffs are all the responsibility of the stove purchasing organization or individuals purchasing SilverFire products. Humanitarian container orders can be ordered with numerous stove options and units can be shipped fully assembled or disassembled. Final assembly in some locations may decrease or eliminate duties and tariffs. Contact us to tell us about the needs of your specific project and field application. 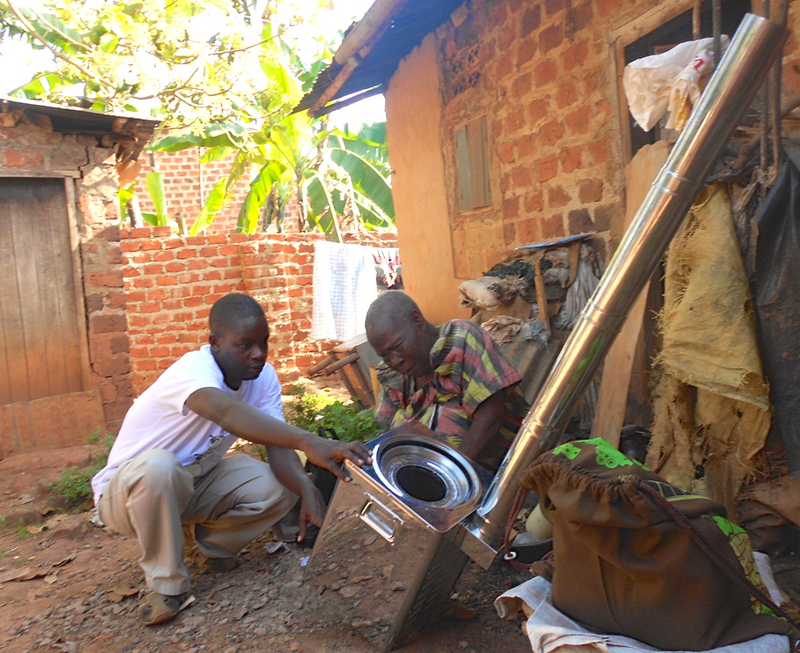 We offer optional low cost stove project training instruction to maximize stove project success, upon request. Transportation and customs clearance are responsibility of customer. Stove consultant fees are applicable, if required. Please contact us for specific needs of your project. We recommend purchasing test stoves for field evaluation for your project's requirements and acceptance, in your specific market. Individual test stoves for evaluation are shipped via the postal service as humanitarian commercial samples. 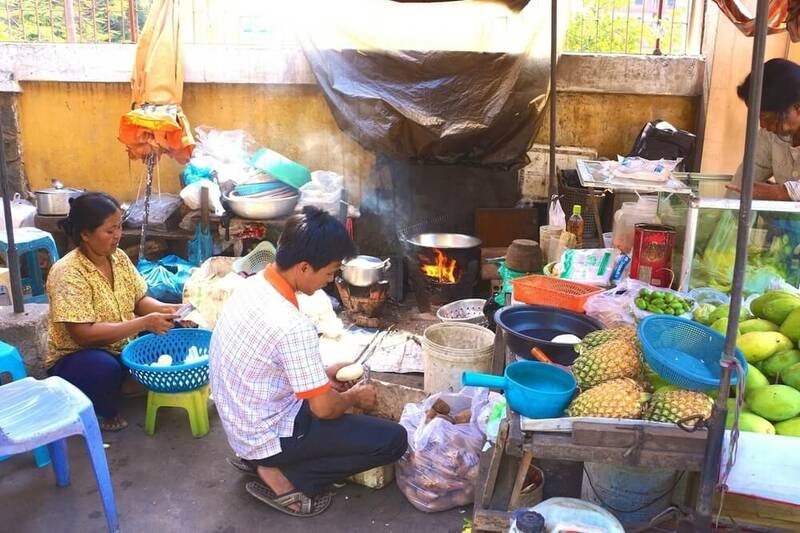 All costs are paid for by the stove project organization or party interested in implementing humanitarian stove projects at humanitarian discounted pricing. SilverFire recommends our educational consultation services with any stove project. Contact us regarding our low cost option to train your field trainers. 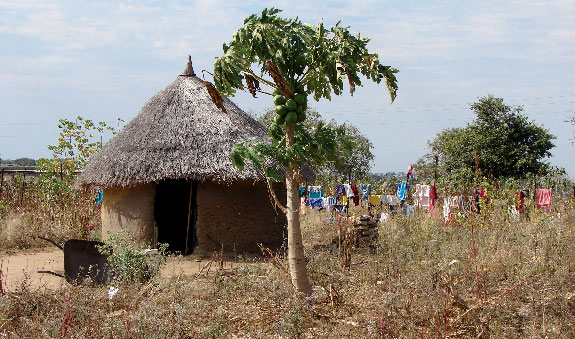 We received the photo below with a stove placement in Uganda. This photo is a great teaching moment. This cook was likely cooking indoors with a 3 stone fire in the past. After she is shown our Hunter Chimney TLUD stove assembly above, the stove consultant did not instruct how the correct diameter pot should be supported on top of the stove. An appropriate diameter pot would provide the correct combustion gap and would seal off all emissions into her home. Note in the photo below that her pot is resting directly on top of the combustion chamber, instead of being supported on top of the stop. This means the gap between the bottom of the pot and the top of the combustion chamber was eliminated, thus the stove is not functioning as intended. Maximizing correct combustion gaps to maximize heat transfer is very important. She is actually retarding combustion the occluding fire by placing the pot directly on top of the fire and eliminating the correct combustion gap. Worse, emissions are leaking into the household between the pot gap and the stove top. If this cook had been instructed on how to seal the stove off with a larger diameter pot, the stove would function more efficiently and all emissions would be vented through the chimney outdoors. Education is a key component of any effective stove project or distribution program.